Along that sliding scale, messing with voting machines or voter rolls, or taking advantage of bad ballots (as in Florida in 2000) is not OK; breaking into your opponents’ campaign headquarters is not OK (as in Washington DC in 1972). Gerrymandering districts or refusing to hold confirmation hearings on a Supreme Court nominee are on the edge—technically, that’s working within the system, but it’s still dirty pool. And, in general, technology changes it all, as with my previous examples of how Fascism or just bad democracy results from media shifts—Leni Reifenstahl or Joseph Goebbels or Roger Ailes getting monstrous results from film, radio and television, or (just to argue the other way) local Democratic candidates getting “unfair” boosts in funding across state lines thanks to DailyKos. We’re on the edge of serious darkness and chaos with Trump. Too many of our basic principles of democratic rule are rattling and straining under dangerous pressure, because of Reality Television and microtargeting and hacked computers. 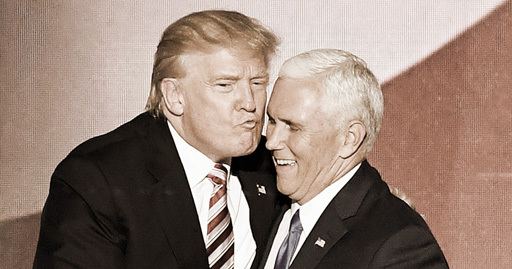 And, since I’m being called out by The National Review (as a self-appointed representative of “the Left”), I have to hold my head up high and say, Yes, if Mike Pence becomes President I will lead “a national chorus of ‘Whew! Back to normal’” —I will continue to believe what I’ve always believed and stand by what I’ve always stood by as a patriotic American. I will repeat the Gerald Ford lines about how “our system works—this is a government of laws and not of men” and I will watch lame-duck Pence and his party be decimated in the midterms as the basic, cherished wheels of American democracy grind away the last remnants of this horrible freak mistake.